Display an entire journal in your portfolio page. Entries per page: Decide how many entries you want to display. Entries beyond this number are accessible via a page navigation bar. Display one journal entry in your portfolio page. 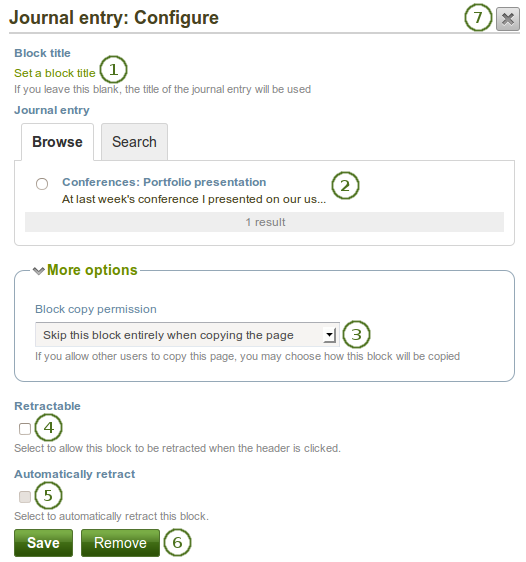 Display recent journal entries across all your journals in your portfolio page. 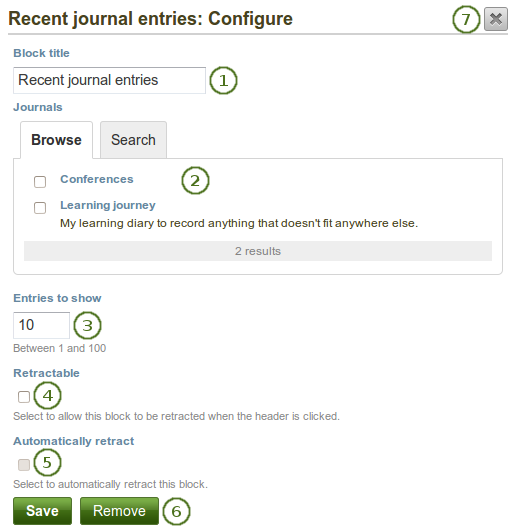 Once you have included the Recent journal entries block into a page, you can create a new journal entry directly from that block when you are in the Edit mode for the page. When you click the New entry button, you will be taken to your journal and a new entry is started for you. It is then added to the journal automatically. Display tagged journal entries across all your journals in your portfolio page. My tags: Select the tag for which you want to display all journal entries. 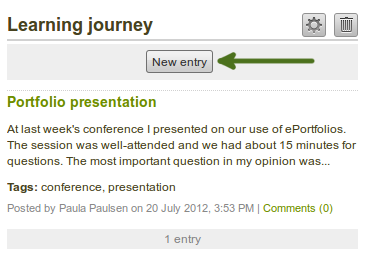 Only tags you used on journal entries are shown in the drop-down menu. 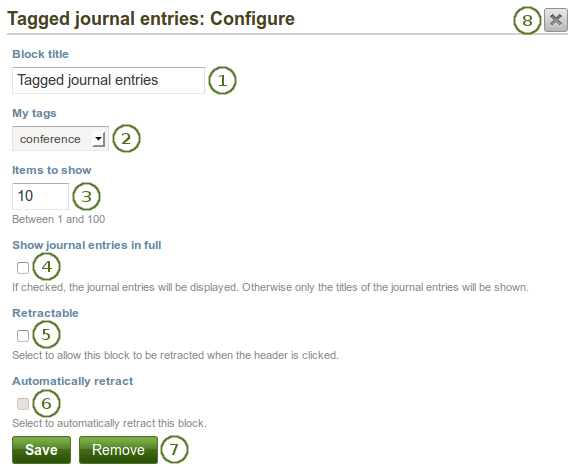 Show journal items in full: If you select this option, your journal entries will be displayed. Otherwise, only their titles are shown and people need to click on them to read your entries. Once you have included the Tagged journal entries block into a page, you can create a new journal entry directly from that block when you are in the Edit mode for the page. When you click the New entry button, you will be taken to your journal and a new entry is started for you. 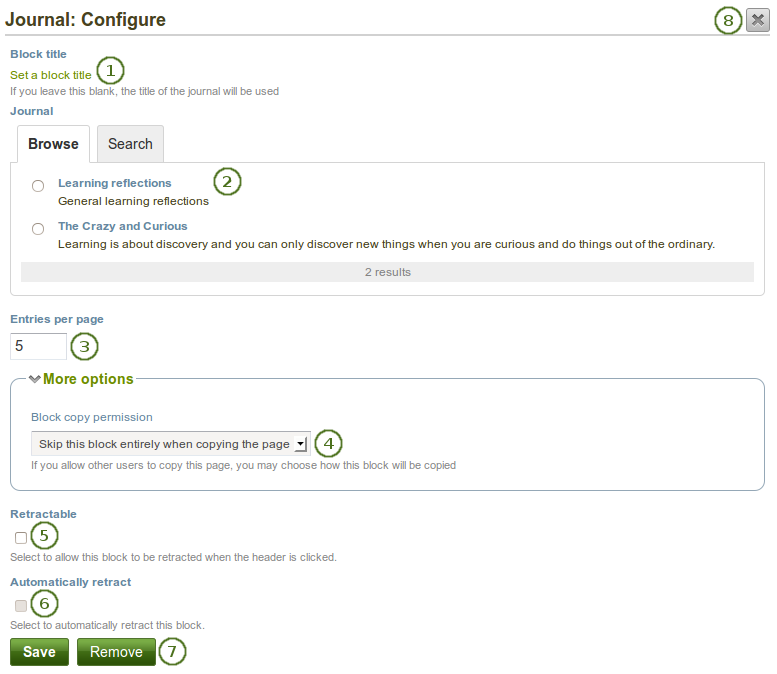 It is then added to the journal automatically with the tag whose journal entries are displayed on the page.